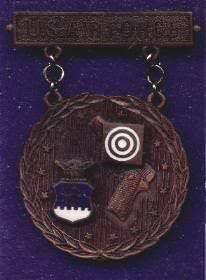 I keep seeing threads where the OP has a Distinguished Pistol Award. How does one earn this award or where can one go to find information on this. I tried to Google this without much success except to say it is quite an honor to received such an Award. You need 30 points to make Distinguished. You get points by being one of the top non-Distinguished shooters in a CMP service pistol Excellence In Competition (EIC) match. It takes at least three "legs" (finishes high enough to earn points) to earn the award and EIC matches are only held at state, regional and national championships. CMP equipment rules are more restrictive than the NRA's. Pistols have to be on an approved list, they have to have iron sights and at least a 4 pound trigger, and they can't have anatomical grips. Ammo has to use either jacketed or plated bullets. Does one of the "legs" still have to be a ten point leg? I am not trying to earn a distinguished award but when I can, I do shoot in the distinguished matches because the number of shooters participating in a specific match determines how many points can be earned in that match. As I tell people, I am not trying to earn points, I am trying to help others earn points. BE Mike wrote: Does one of the "legs" still have to be a ten point leg? 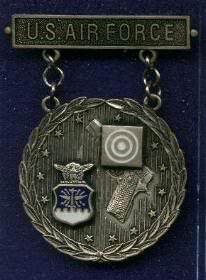 Take note that the "Distinguished Pistol Award" by first the DCM and now the CMP is the same but not the same as the Distinguished badges by the services. USA, USMC, USN, and the USAF each have their own set of rules that detail the gun and ammo and then the match level that points must come from. State Championships, Regionals, Service Championships, Interservice, and then Camp Perry. At some point in time there were leg points available at military "Combat Matches." 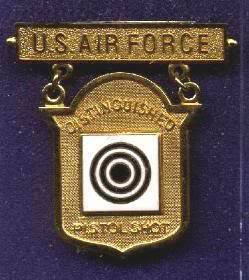 For a long time the USAF didn't recognize combat EIC points. At the levels that points are allowed all competitors, civilian and military, are clumped together to compete for points. Don't know what has become of the service badge requirements now that the CMP has watered it down. Mine came in '84 before it all changed. Thanks for sharing the pictures, the "leg" medals are much different / elaborate than the civilian version. Nice !